It turns out the Internet is great for preserving culture form the past. With each new generation, cultural artifacts from past generations just keep piling up, as accessible as anything made today. YouTube preserves old shows and music, Amazon preserves antiques and collectibles, and hundreds of blogs (don’t look now, but you’re reading one!) dig up history from a century ago and serve it up right beside today’s news. Which explains why even the current crop we’re calling “Generation Z” is still familiar with the culture of Millennials, Generation Y, Generation X, Baby Boomers, and even the Greatest Generation. If you have teenagers in school right now, visit the school and behold the kids roaming the halls with T-shirts featuring Bob Marley, Sublime, Jimi Hendrix, Prince, and even The Beatles. They’re not being ironic; several members of each generation feel as if they were “born in the wrong decade” because the timeless classics from years past speak to them more than the current crop of auto-tuned alt-rock bands playing on Top-40. Retro and throwback media is just that accessible. When you can pull up an episode of The Honeymooners, a Frank Zappa concert, a Lenny Bruce stand-up clip, and a 1980s Transformers commercial, the concept of generational culture becomes erased. Maybe someday we’ll lose the idea that a specific toy, game, or TV show belongs to people of a certain age bracket. For now, we get to enjoy 14-year-olds gushing condescendingly at a 50-year-old in Star Wars cosplay because “the old people are trying to fit in with us,” heedless of the fact that Star Wars is now 41 years old and still relevant. It’s just like what kids called a lunch box last century, but what’s more remarkable is the design. Before the times of 24/7 media on a million channels, TV stations would actually do this crazy thing called “signing off.” They’d simply run out of content for the day, play the national anthem, and say “good night.” Then if you tuned in past, say, 10 o’clock, this test pattern would be all that was on, sometimes accompanied by a harsh electronic squeal droning on. It was scary! ★ KID-ORIENTED-Eye protection, enhanced screen rear light for dim and shiny environments to protect kid's eyes; Full all real 16 bit-game, games smoother and clearer picture quality, can have fun as well to ease eyes. ★ Game Playing--Start a game trip with "ON", select the favors by joystick, volume controlling to please everyone; 3 x AA batteries (Not included)support up to 3-4 hours playing, Let kids release their joy and energy without disturbing. ★ WHY US--Mini but Fun, elegant shape, heavy-duty material, inspiring sound effects, easy to play and comfortable to enjoy, exquisite packaging fits specifically to kid as a present! We’ve posted table-top arcade games here before, but this is the first time we’ve seen a miniature arcade cabinet play more than one game. Indeed, this spiffy little piece matches a Nintendo handheld, with some 200 games built-in. 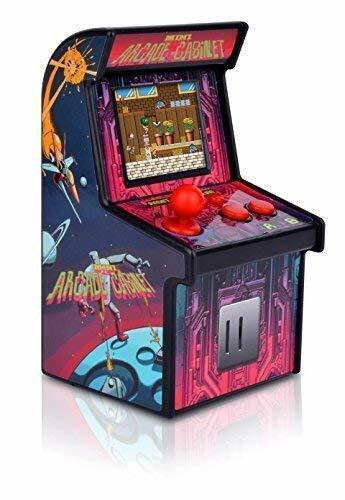 The games are more modernized than its retro aesthetic, but the cabinet is more authentically ’80s than Sam Kinison and Mr. T doing the Moonwalk. 80's Retro Table Decoration Kit INCLUDES 1 large centerpiece, 2 scalloped centerpieces, 12 scalloped table confetti pieces and 24 round table confetti pieces. 80's Retro party table decorations are perfect for a 1980s party. 80's Retro party decoration kit SIZE 1 Accordion-Folded Centerpiece (may also be formed into a cube using the included stickers), 30" long x 7.5" tall; 2 Scalloped Centerpiece Stands, 5.5" wide x 5.75" tall; 12 Scalloped Table Confetti Circles, 2.5" diameter; and 24 Round Table Confetti Circles, 1.5" diameter. The unique design and variety of pieces makes this 80s party decoration kit an impressive addition to any 1980s party. EASY TABLE DECOR: 80's Retro large centerpiece paired with the scalloped stands looks great down the length of a table or separated onto three different tables and accented with the confetti pieces. Get creative and use the table confetti for DIY party ideas, as well. Hole punch each scalloped circle and sting as a small banner, use as favor tags or add to candy jars. Rock star 1980s centerpiece and decoration kit will make a statement however you choose to use them. 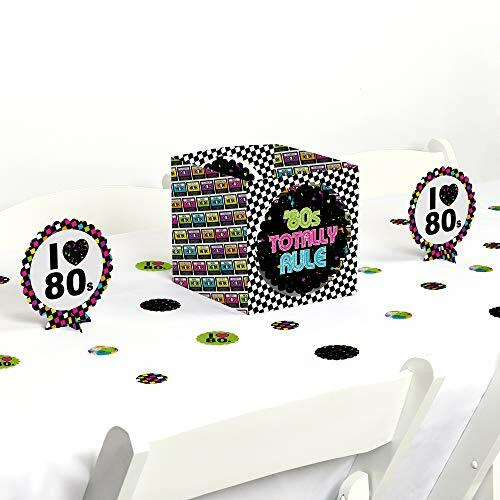 PREMIUM PARTY SUPPLIES: 80's Retro centerpiece and table decor kit is professionally printed on heavy-duty cardstock paper with a photo-like shine. They are individually inspected and carefully packaged by hand. Centerpieces and table confetti will arrive flat. Get creative with your DIY party ideas! MADE IN THE USA: 80's Retro - Totally 1980s Party Centerpiece & Table Decoration Kit is designed and manufactured at our Wisconsin facility using materials that are Made in America. 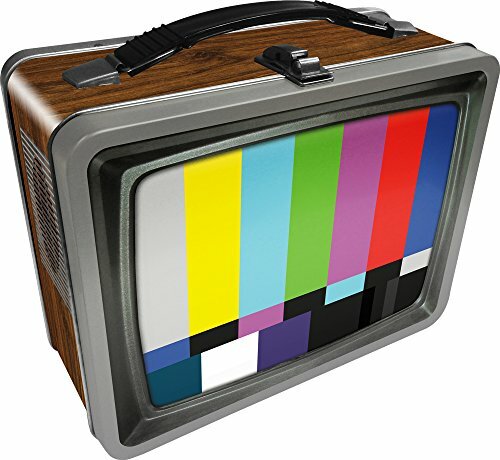 Wow, it’s MTV in a box! This is a 1980s party decoration kit with centerpieces and confetti, printed with distinctive ’80s-era artwork. Those pictures of rectangular things on the side are tape cassettes, which is how people listened to music for a whole decade until CDs came along. The tape inside would come unwound and you’d have to find a pencil and twist the little spool in there to re-spool the tape, when you weren’t busy untangling the phone cord. 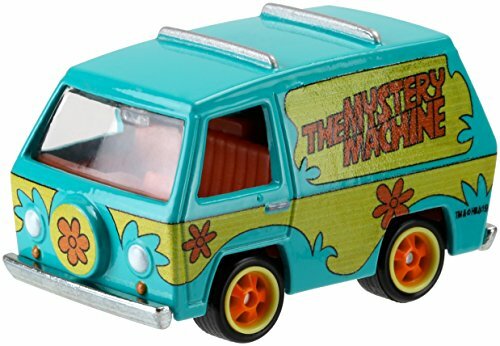 We can’t believe Hot Wheels are still around, to say nothing of the enduring cross-generational appeal of Scooby-Doo. The Hanna-Barbera animated franchise, launched in 1969, has been preserved thanks to endless TV syndication. While the end of “Saturday morning cartoons” seemed like Scooby-Doo’s reign was finished, the show found new popularity thanks to runs on the cable channels Cartoon Network and Boomerang. Grandparents and grandkids watch it together. How is this happening? KEEP YOURSELF ENTERTAINED: With the Handheld Water you can keep yourself entertained for hours! It is a perfect way to pass your time in waiting rooms, long queues and when you are taking a break from work or studying. It is very fun and playing with it will get you hooked. You will want to have it in your hands and pressing those buttons all the time. The fun is everlasting! 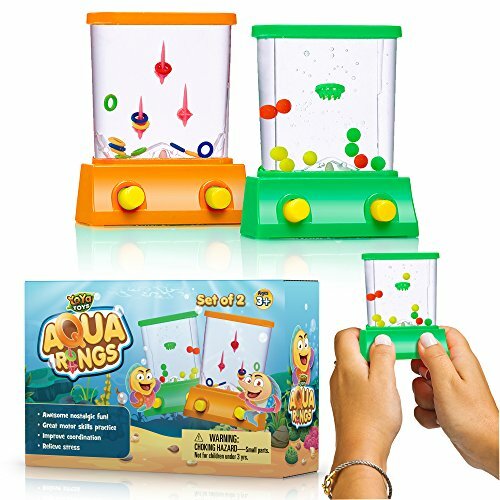 2 DIFFERENT WATER GAMES: Did you grow up playing the Fish Ring Toss Game or the Basketball one? Well, now you can play both. Miss your 90s toys? This pack consists of both these games to make you feel more nostalgic than ever. And since the Water Games will be 2, you can share them and play or compete with a friend. You can even teach your kids how to play this Game that was part of your childhood. TAKE IT WITH YOU EVERYWHERE: Both Handheld Water Games are as big as your hand. To be more precise, their dimensions are 2.5x3.25 inches. They are extremely lightweight and compact so you can take them with you everywhere you go. Put one in your bag or in the big pocket of your jacket and take it out whenever you feel like keeping your fingers busy. What a practical size! GREAT WAY TO RELIEVE YOUR STRESS: The Handheld Water Game is not only fun, but it can also be very useful in cases of stress and anxiety. Whenever you feel your stress taking the best of you, don't panic. Instead, start playing with the Fish Toss or the Basketball Water Game. It is a great way to relieve your stress and calm down. So if you tend to get stressed, a Water Game is what you need! THE PERFECT TOY FOR ALL AGES: It doesn't matter how young or old you are. If you are 5 years old and above, then the Handheld Water Game is perfect for you! It is easy to play and challenging at the same time. One great thing about it is that it doesn't need batteries or charging. The two buttons simply create an airflow, which propels the rings and the tiny balls. It is simple yet fun! You young whippersnappers never saw this coming! Right up until the first battery-powered LCD games came out, these water-based skill games were quite popular. Pushing the buttons on the bottom made water squirt out in a jet, and in each game there were plastic pieces you had to steer this way. Or until you ran out of patience and just shook it upside down and around. There were rows of them at the mall; half the school played them at recess, and they were surprisingly a lot harder than they looked. Another oldie test of skill you saw everywhere back in the day and hardly see anywhere now. Various games like this one were made of wood and wire, with a steel ball to control until it reached a goal. You’ve likely seen the maze one, so here’s its simpler but far rarer cousin. 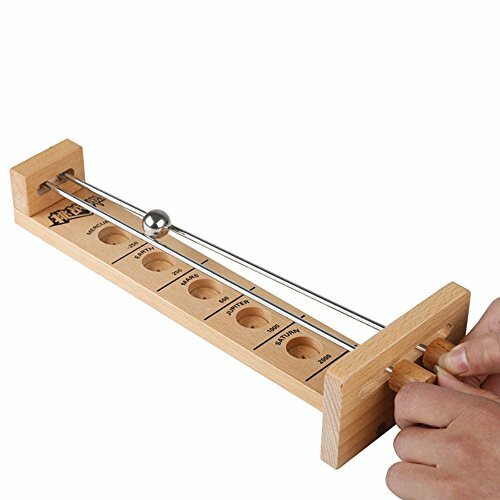 Control the ball using the two rods to drop it in graduating holes. Yes, kids, we played this for hours, it was our X-Box!